William H., 10 Jun 1844 - Jun 1862. George, 15 Oct 18466 - 12 Sep 1901, M. Barbara A. Roeder. Henrietta "Hettie" (Shinaberry),9 17 Mar 185010 - 192311 , m. Charles Alden Shinaberry. 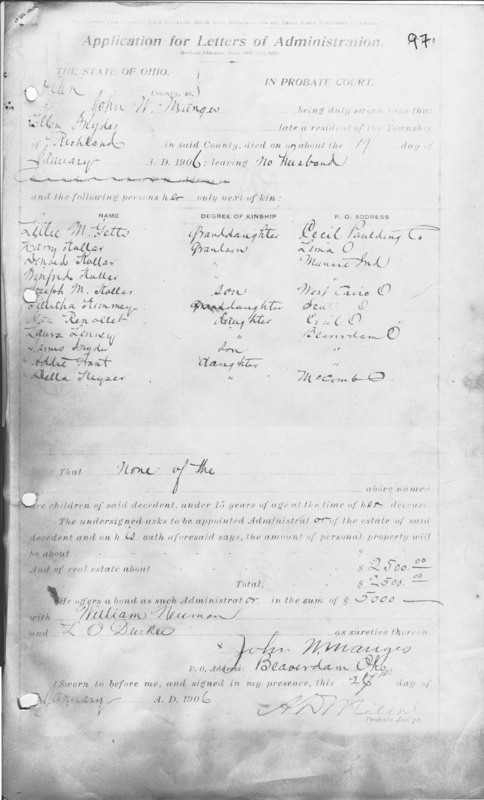 Walter,12 14 Oct 1852 - 15 Feb 1927, m. Elizabeth "Lizzie" Roeder . 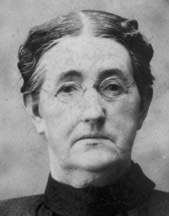 Jasper, 29 Mar 1854 - 17 Nov 1926, m. Alice Lackey. For stories about Jasper and his family, see the 1956 account by Calvin Snyder. Newton,13 9 Jun 185714 - 31 Mar 192315, m. Emma Custer. 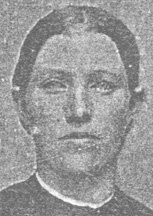 Anna (Prottsman), b. 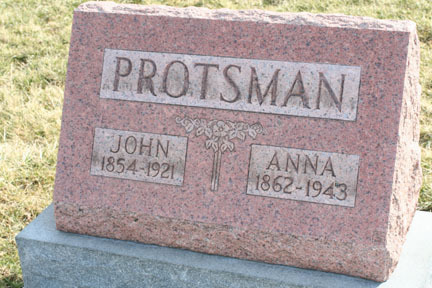 26 Nov 1862 - 194318 , m. John Prottsman. Written on margin in same handwriting: "at milk house as it was when she lived here". On the back was written "Old milk house at Mom's home farm"
In 1862, the family sold out and moved back to Bath Township. There they bought the farm on Sugar Creek Road one half mile west of Slabtown Road. A distinctive feature of this farm was the large brick house that would eventually be occupied by four generations of Snyder descendants. 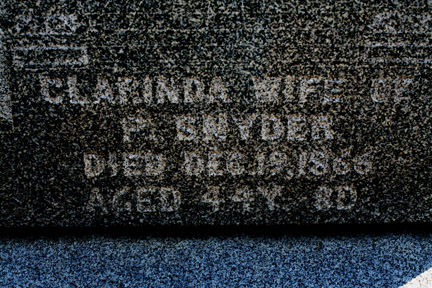 On 19 December 1866, Clarinda died at the age of 44. She had spent 23 out of her 26 years of marriage either pregnant, or caring for infants in diapers. 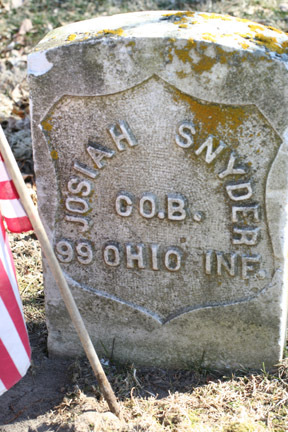 She was buried in Shawnee next to her two sons. Peter remarried to Ellen (Baker) Kollor, widow of George W. Kollor and seventeen years his junior. Mrs. Kollor was born on 10 July 1837, the daughter of John and Arzilla (Minnis) Baker. 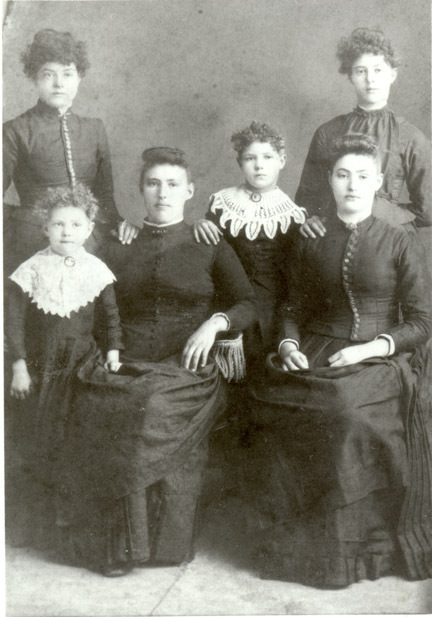 By 1870, their household contained the six youngest children of Peter's first marriage, Talitha, Joseph, and George W. Kollar, Jr., children from Ellen's first marriage, and Alta, Peter and Ellen's child. Also living with the family was Peter's oldest daughter Marilla Reed, whose husband had died, and her two sons, William and Arthur Reed. Alta (Roberts)(Renolett) 1 Aug 186927 - 16 Dec 1955. 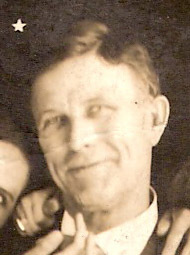 Alta married Albert Roberts of Bath Township, but they were divorced. She met Charles Daniel Renollet, a telegrapher in Cecil, Ohio, and they were later married. They lived in Paulding County, Ohio where he worked as a building contractor. 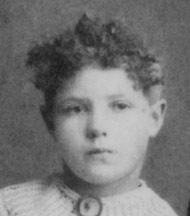 Alta and Charles had one child, Raymond Charles Renollet. 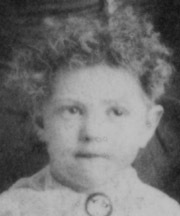 In 1920 when they moved to Defiance, Ohio where Charles died on 1949 January 15. In 1951 Alta was the first person to be admitted into the River Rest Convalescent Home. She died there in 1955. 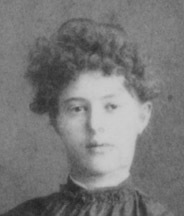 Ida May (Getz) 16 Feb 187128 - 27 May 1894. 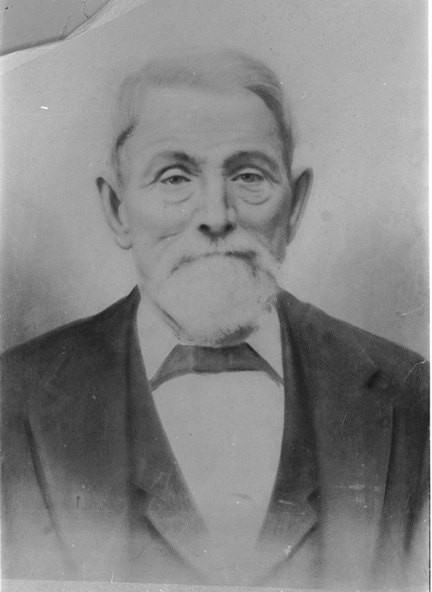 Ida married James Getz of Bath Township. They had one child, Lillie M Getz on 1893 July 1. About nine months later, Ida died. 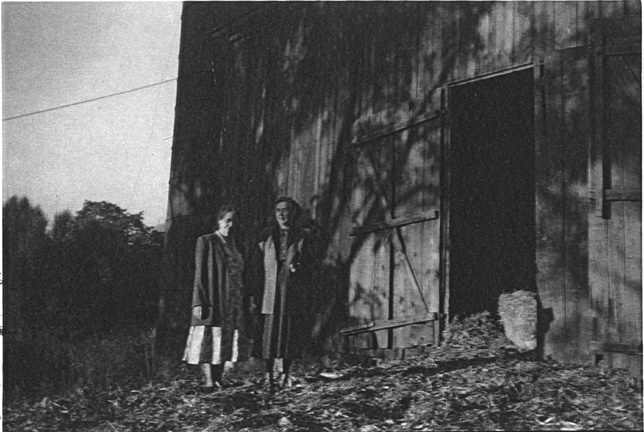 Lillie lived with her grandparents, Peter and Ellen. 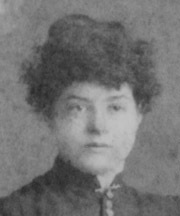 Della (Kiser)(Cox) 8 May 187229 - 24 Mar 1954. Della married Dr. Kiser of Bluffton, Ohio. They had no children. When she was in her 50's, her first husband died. In the 1930's she married Lorenzo Cox. Edward F. 16 Sep 187330 - 20 Aug 1899. Edward lived in Beaverdam. He died of tuberculosis and had no children. 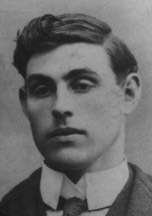 James 26 Oct 187531 - 4 Mar 1933. 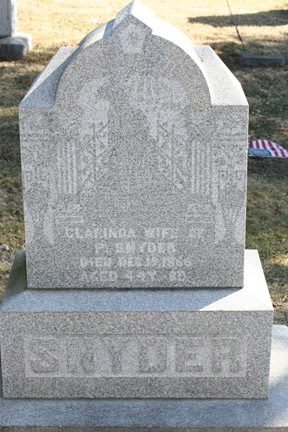 Jim Snyder had some kind of disability in one leg that caused him to put his hand on one knee when he walked.31a He married Eva 1870-1951. He also had no children. Laura (Lenney) b. 7 Apr 187832. Laura married John Lenny. They had only one child, John Lenny, Jr.
Adda (Grant) 1 Jun 188133 - 23 Jan 1936. Addie married Oren Grant. 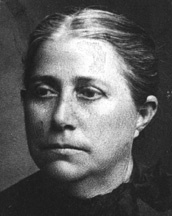 They had three children, one of whom was Evelyn E. Grant Drew. At the time that she died in 1936, they lived in Kiefer, Oklahoma which was an oil town. Many of these children were members of the Church of Christ. In 1875, Peter bought a farm in Bath Township on Findlay Road (now the Old Dixie Highway) just southwest of Thayer Rd. Peter and Ellen lived there for the rest of their days. 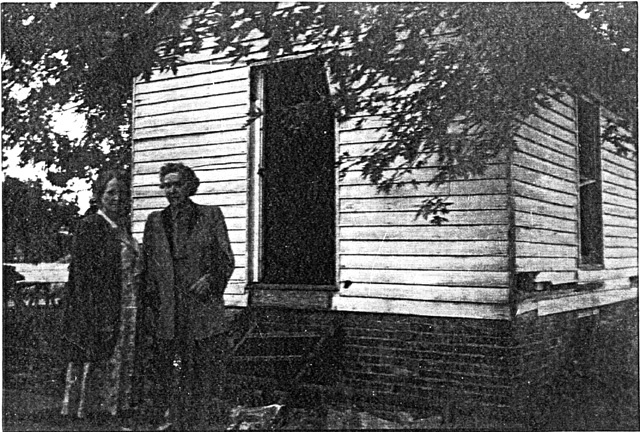 About this time, George, his oldest living son was married and lived on Peter's old farm on Sugar Creek Road. George later bought the farm from his father. 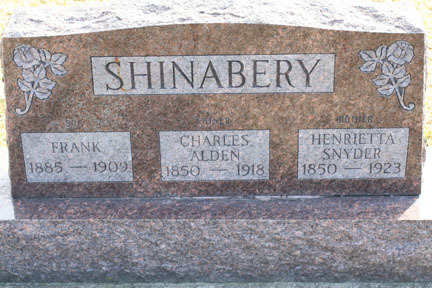 In his last years, Peter's daughter Henrietta Shinnaberry and her family lived on his farm. Peter and Ellen lived in a little house just west of the Shinnaberrys. Lela (Shinnaberry) Jacobs remembered them butchering beef when she was a little girl. They would take a quarter of beef and hang it up over the stove to dry it. When Lela would go down to visit them, her "Aunt Ellen" (as she called her) would cut a piece off and give it to her. Lela thought that was pretty good! 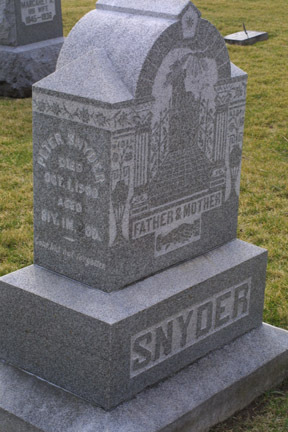 Her only memories of her Grandpa Snyder were that he had a moustache and was not a very large man. 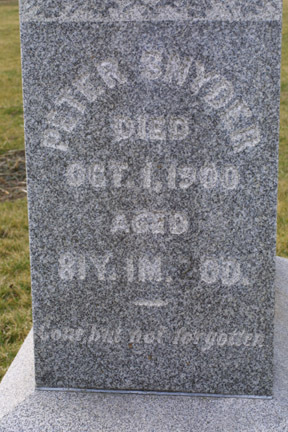 Peter died on 1 Oct 1900 at the age of 8035 and was buried in the old Beaverdam Cemetery. Lela remembered riding in her mother's lap in a horse and buggy on the way to his funeral. At her young age she couldn't understand why her mother felt so bad and was crying.36 The process of settling Peter Snyder's estate among his eighteen children was immense and took years. 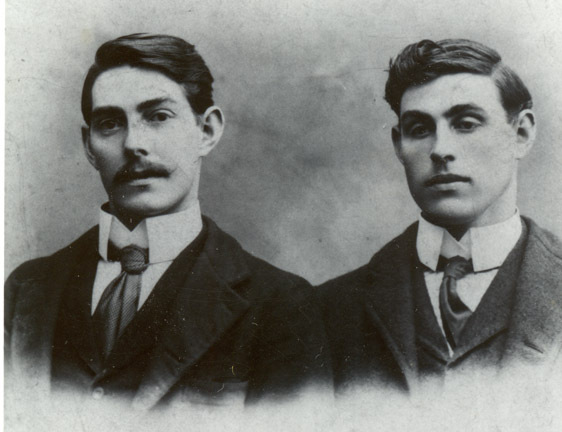 Peter's executor was his son George, but George died before settling the estate, so the task fell to Dave Byerly, who was George's executor (George also had a large family).37 One result of this is that tombstones for Peter, George, and Peter's first wife Clarinda were purchased at the same time. So although they are found in three different cemeteries, they all have the same style. 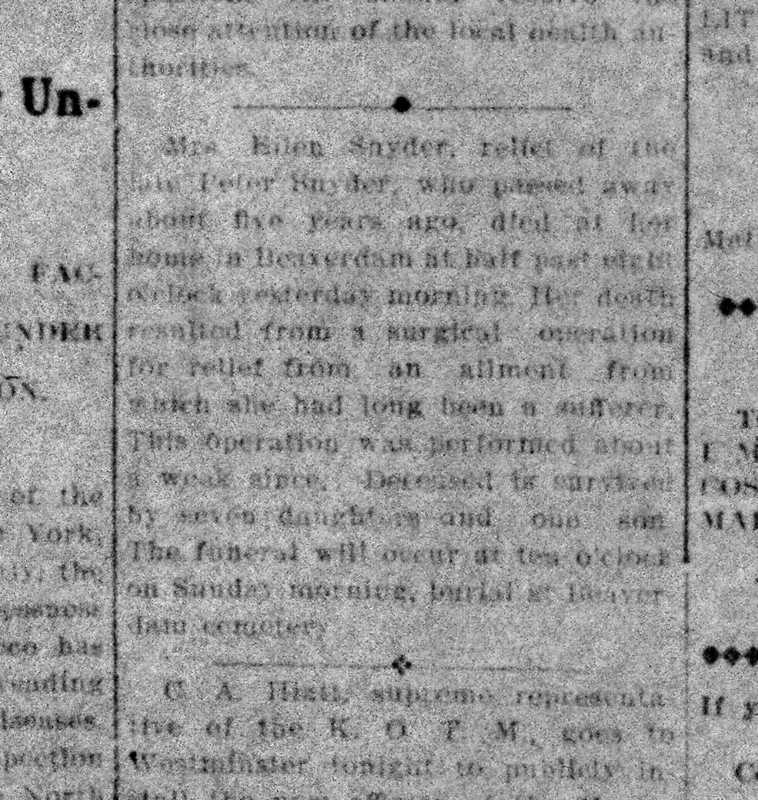 Ellen Snyder lived for about five years after Peter died. 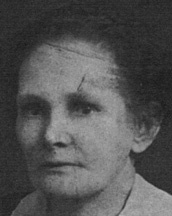 She was ill for some time and had an operation to relieve her condition, but it failed and on 17 January 1906 January she died.38 View next of kin. This account was modified from History of the Edgecomb, Bassitt, and Snyder Families of Allen County, Ohio by Steven J. Bassett Baskauf, 2007. This portion of the book is freely available under a Creative Commons Attribution 3.0 License provided you give the citation listed above. On the web, a link to this page would be helpful. 2. History of Allen County, Ohio. Chicago: Warner, Beers & Co., 1885. p.587-88. 2a. 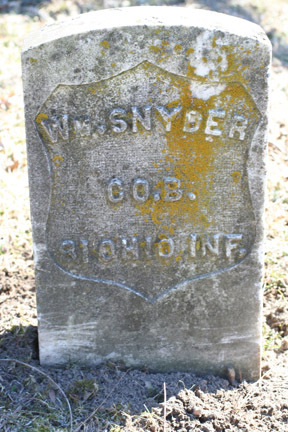 The 1840 census record (no date given) shows a 20-30 year old Peter Snyder living with a 15-20 year old female (Clarinda was 17 in 1840) and a male under the age of 5 (their son Josiah's birth date in the family Bible is given as September 28, 1840. 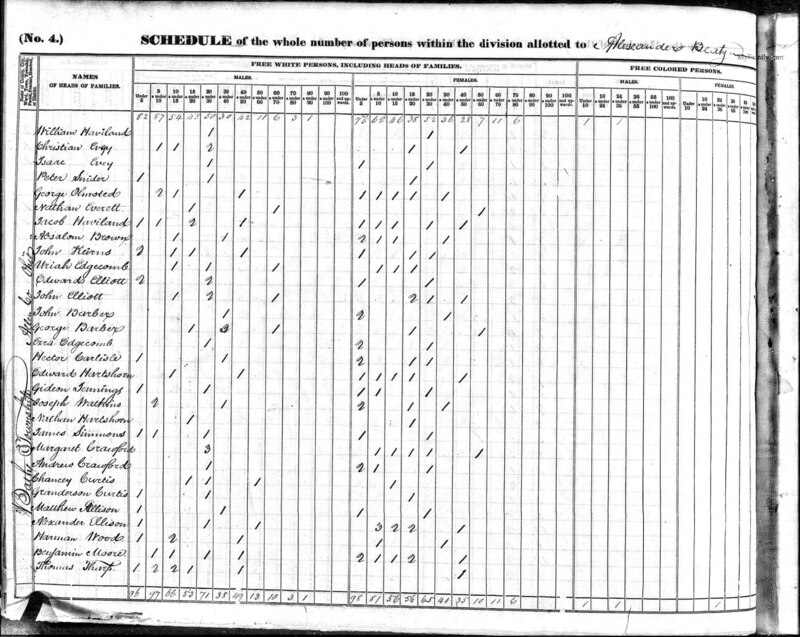 Josiah's age was given as 10 in the 1850 census which was taken on 19 July 1850. In any case, the dates suggest that the marriage may have been sped up by a pregnancy. 3. 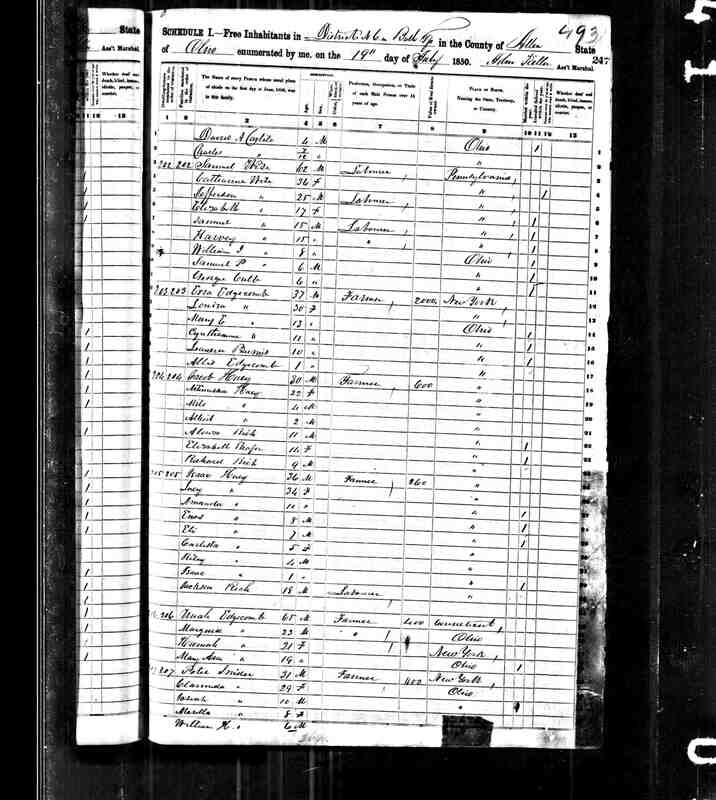 Allen County, Ohio Marriage Record No. 1 (1831-1842), p. 119. 4. Family Bible of Peter Snyder. Copies of the information in the Bible were provided by Brian Clark of DeGraff, Ohio. The owner of the Bible is unknown. Note: The entries were probably made as late as 1890, and so there may be inaccuracies in the exact dates. 5. Josiah's birth date in the family Bible is given as September 28, 1840. 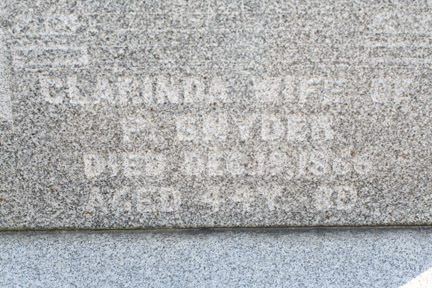 It seems unlikely that he was born before this, since Peter and Clarinda were married on 9 Apr 1840. 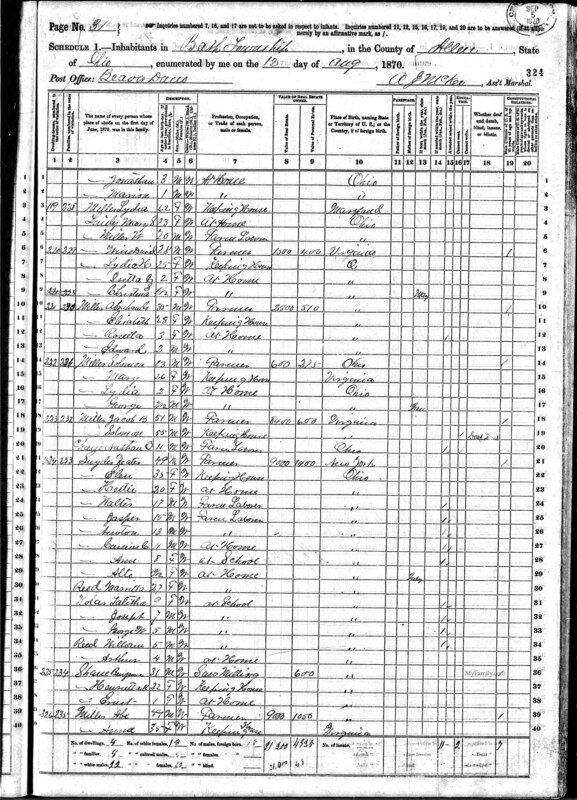 However, the 1840 census lists a male under the age of 5 in the household, and the censuses were usually taken during the summer. 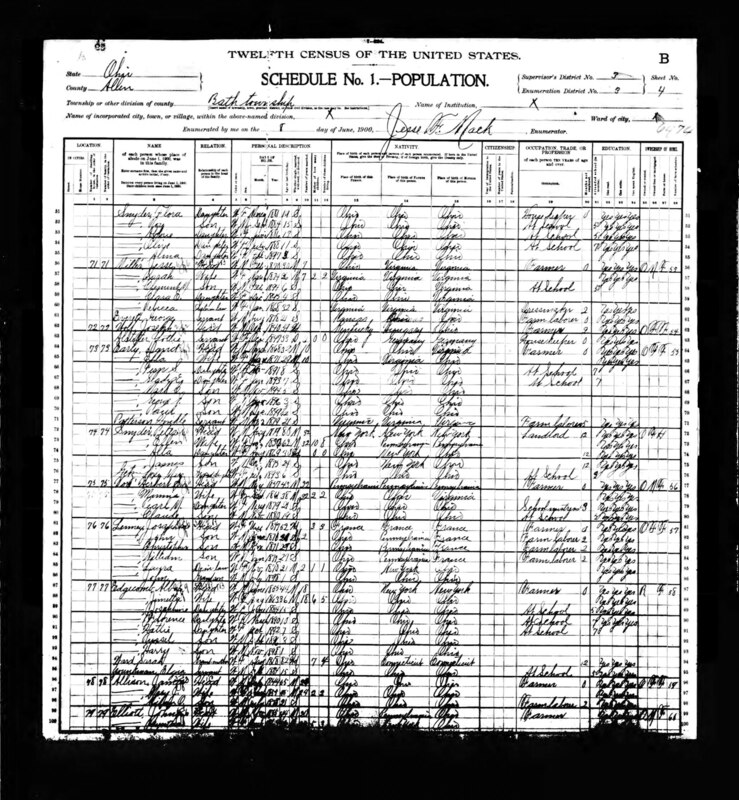 His age was given as 10 in the 1850 census which was taken on 19 July 1850. 7. Vernon Cloyd Hennon, BES family update 13 (1977). 8. Date given in Peter Snyder family Bible is September 14, 1847. 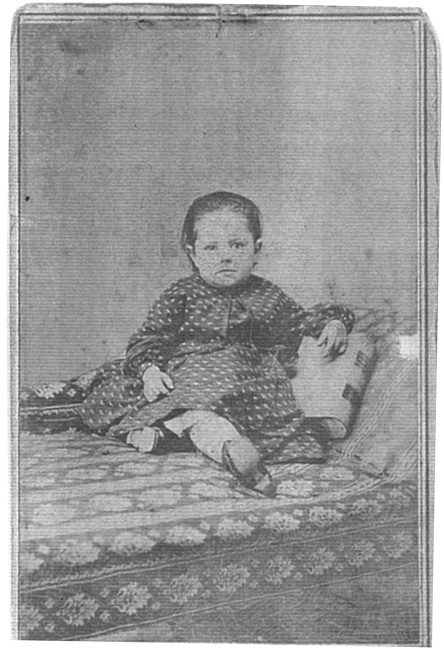 In the 1850 census, taken on 20 July she is listed as aged 2. 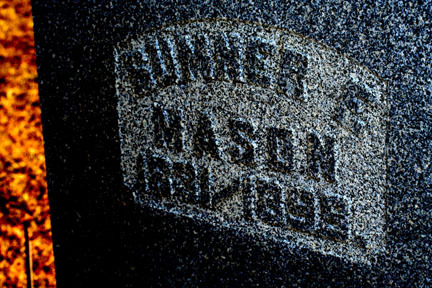 Date given on tombstone is 1848. 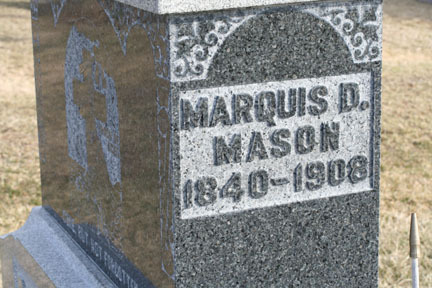 Image of tombstone Marquis D. Mason inscription. 9. Lela Shinaberry, BES family update 31 (1977). 10. Date given in Peter Snyder family Bible is March 17, 1849. However, this is clearly wrong since the 1850 census lists her as 6/12 years old on 20 July 1850. 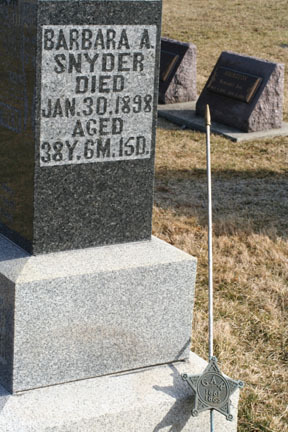 On her tombstone, her birth date is given as 1850. 12. Margaret Louise Hall Hall, BES family update 88 (1978). 13. Raymond K. Snyder, BES family update 56 (1977). 14. In I. John Letherman, All Leatherman Kin History [Descendants of Elder Daniel Leatherman] (1940), p.83, Newton's birth date is given as 1858. In the family Bible of Peter Snyder it is given as 1856. 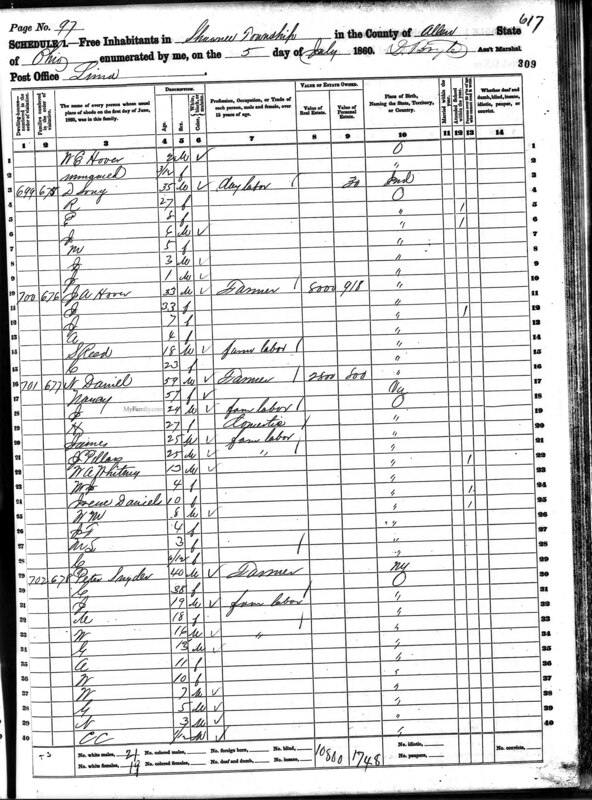 However, the 1860 census for Shawnee Twp., Allen Co., OH (p.309), taken on July 5 gives his age as 3 and the 1870 census gives it as 13. Thus 1857 seems more likely to be accurate. 16. Kathryn Snyder Geiser, BES family update 27 (1977). 17. 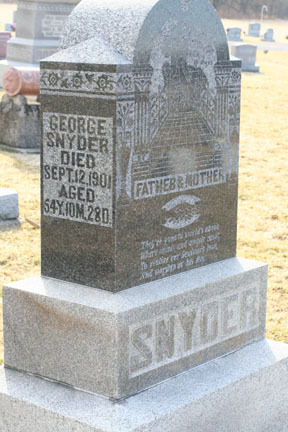 The family Bible of Peter Snyder lists his birth date as 1859. However, the 1860 census, taken on 5 July gives his age as 1/12 year. Thus his birth date must be 1860. 20. Deeds Book W, p. 228, Allen Co., OH Recorders Office. 5 Sep 1856. 21. 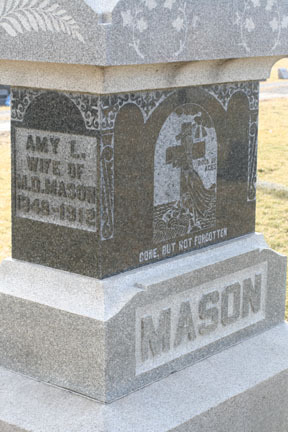 This story was told by Amy Snyder Mason to her daughter Amy Mason Everett. The story was passed on to Shirley Everett Clark and Wib Everett, children of Amy Everett, and was told to Steve Baskauf by Shirley and her cousin Michael Wildermuth. Although rattlesnakes do not now occur in northwest Ohio, the massasauga or swamp rattlesnake was formerly present throughout the northern and central parts of the state. They thrived in the huge wetlands originally present in northwestern Ohio. Habitat destruction has now caused the snake's range to have decreased considerably - the species was last seen in northern Ohio in the 1950's on the Catawba and Marblehead peninsulas near Toledo. The species' habitat is river bottoms and nearby fields, so the "small stream" of the story would have been a likely place to have encountered a massasauga. This rattlesnake species is not particularly aggressive, but it may bite if stepped on while it is quietly sunning itself concealed in vegetation. There are numerous folk remedies for rattlesnake venom. However, it is estimated that as many as 60% of bites of humans by poisonous snakes are "dry" bites where the snake injects little or no venom, saving it instead for actual prey. In another telling of the story, the snake was a copperhead, but it is questionable whether copperheads ever lived in this part of Ohio. Here is a version of the story as told by Michael Wildermuth: "Here is the rattlesnake story. I have heard both my mother [Margery Mason Wildermuth] and Shirley Clark tell it: [Clarinda] Edgecomb Snyder went down to the river (my assumption is the Ottawa River, which ran through their homestead in Shawnee Township, although I feel uncertain as to whether or not this location was actually mentioned) and, unfortunately, was bitten near the ankle by a rattlesnake (I assume an Eastern Massasauga, which are still native here). She called for help and, fortunately, was heard. When her rescuers discovered what happened, they called for buckets of fresh milk to be fetched from the barn or house and immediately plunged her foot into a bucket of milk. The milk curdled as it drew poison from her system. This was repeated until no effect was noticed in the milk. [Clarinda] survived." 21a. This version of the story was told by Calvin Snyder, son of Jasper in an account that he wrote in 1956. 22. Historical Atlas of Allen County, Ohio, 1880, Philadelphia: R.H. Harrison, p.140. 23. Carrie Wallace, interviewed by Steve Bassett (Baskauf) on 1977 August 11. 25. Dates from Family Bible of Peter Snyder. Note: these birth dates agree with the dates listed on an old paper seen by Brian Clark at the Kimmey/Baker Reunion in 1973, except that the dates on that paper were all one year earlier. 26. Information from Portrait and Biographical Record of Allen and Van Wert Counties, Ohio. Chicago: A. W. Bowen & Co., 1896. p.490; interview of Lela Jacobs, 1977; and information obtained from Evelyn E. Drew (daughter of Addie Grant) (page 1) (page 2) and other sources by Brian Clark of DeGraff, Ohio in about 1977. 27. 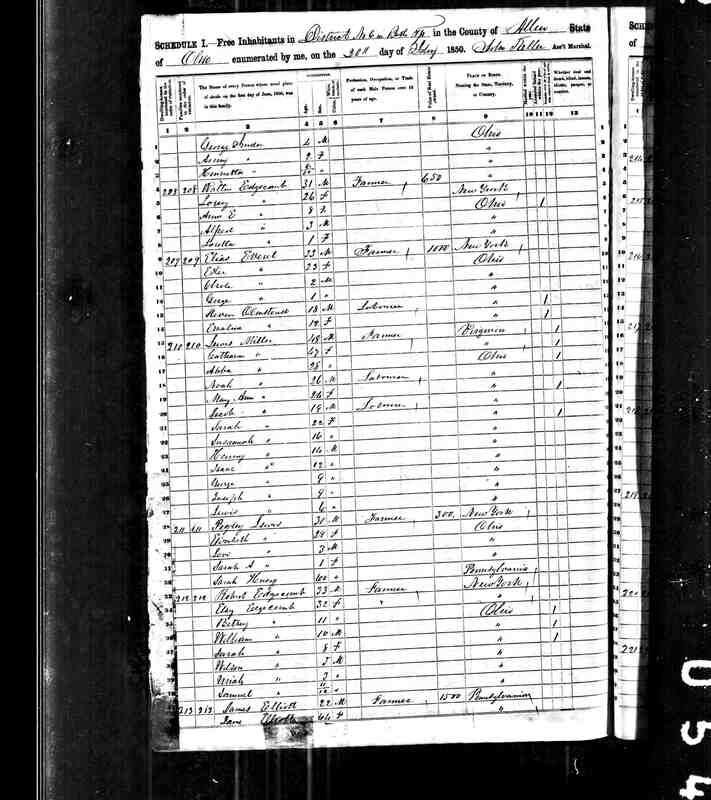 1870 in Bible, 1869 on old paper The 1870 census, taken on 12 August, lists her age as 10/12 year. Either this was a mistake and should be 1/12 (making her born in 1870) or she was born in 1869 and was actually about a year old (and born in 1869). The latter seems more likely. 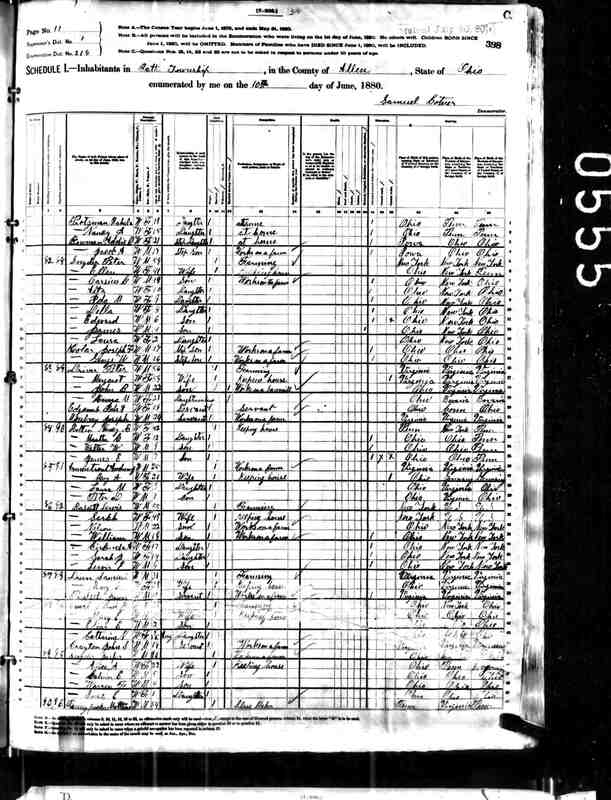 The 1870 census supports this, giving her age as 10 on the 10th day of June 1880. 28. 1872 in Bible, 1871 on old paper Age on 1880 census was given as 9 on 10 June, supporting the 1871 date. 29. 1873 in Bible, 1872 on old paper. Age on 1880 census was given as 8 on 10 June, supporting the 1871 date. 30. 1874 in Bible, 1873 on old paper. His tombstone, old Beaverdam Cemetery, Richland Twp., Allen Co., OH. 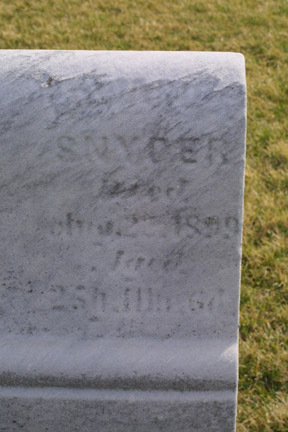 says "Edward F. Snyder Died Aug 22, 1899 Aged 25 y 11 m 6 d". This produces a birth date of 16 Sep 1873 rather than 1874. His age given in the 1880 census is 6 on 10 June, supporting the 1873 date. 31. 1876 in Bible, 1875 on old paper. His age given in the 1880 census is 4 on 10 June, supporting the 1875 date. 31a. Calvin Snyder, 1956 account. 32. 1878 in Bible, 1877 on old paper. Her age given in the 1880 census is 2 on 10 June, supporting the 1878 date. 33. 1882 in Bible, 1881 on old paper. Since the dates on the old paper seem to generally be more accurate, 1881 is used here. 36. Interview of Lela Shinaberry Jacobs by Steve Bassett (Baskauf) on 1977 June 15.